This tasty chicken will make ya’, jump jump. Crispy prosciutto will make ya’, jump jump. Lemon pan sauce will make ya’, jump jump. Don’t try to compare this, to another bad chicken fad. I’m the mom and I’m rad, gonna give ya something that you’ve never had. 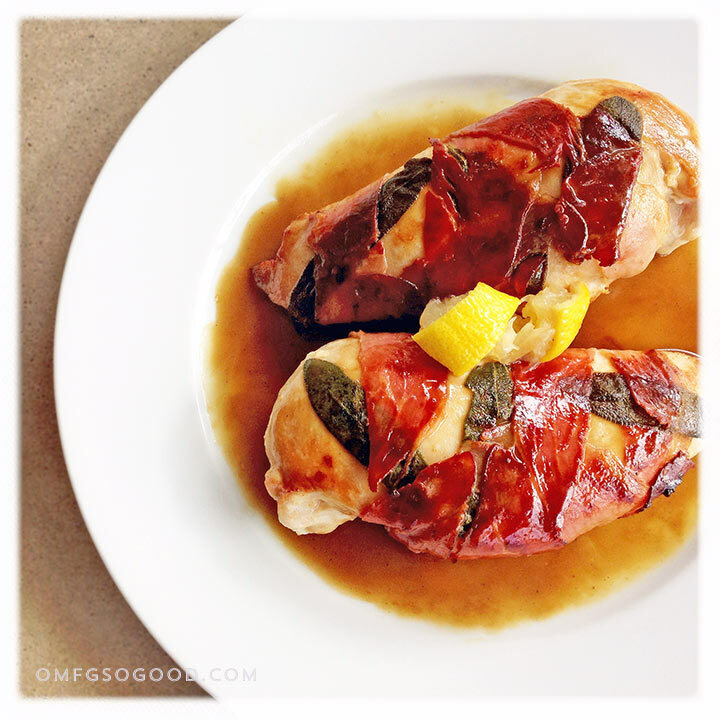 Saltimbocca will make ya bump, bump, wiggle and shake your rump… Because I’ll be bringing the flavor that’ll make ya wanna jump. Aaaand, I predict someday this will be the post my children will wish never existed. The translation doesn’t mislead. This chicken is super good. And, much simpler to prepare than it appears, with just a few scant ingredients and around 25 minutes of your time. Preheat the oven to 350 degrees. Sprinkle both sides of the chicken breasts lightly with salt and ground white pepper. 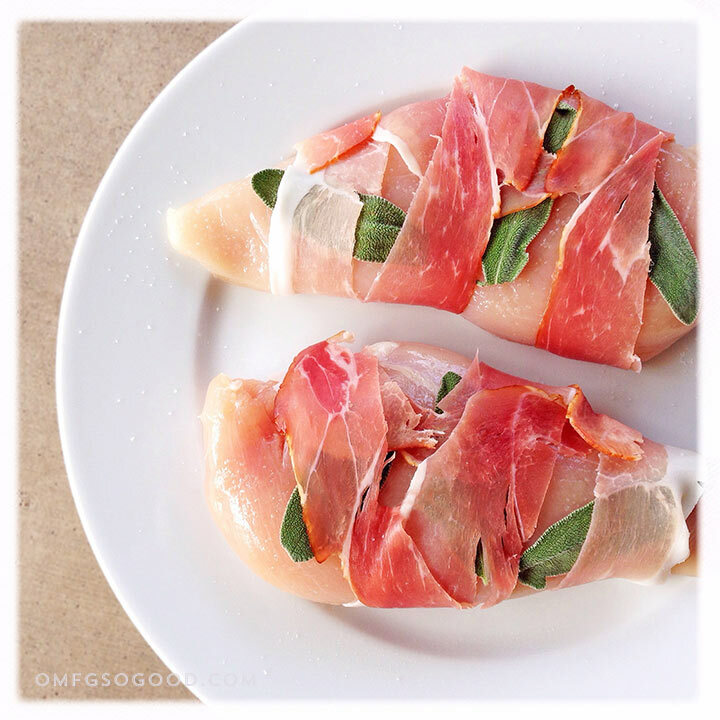 Place three sage leaves on each chicken breast, then wrap three strips of prosciutto around each, securing the sage leaves in place. In a large, oven proof skillet, heat 2 tbsp of the olive oil over medium heat. Add the chicken to the pan and cook two minutes on each side. Transfer the pan to the preheated oven, and cook for an additional 15 minutes, or until the chicken is no longer pink inside. In a small bowl, whisk together the remaining 1 tbsp olive oil, lemon juice, chicken stock and corn starch. Transfer the chicken to a serving plate, and carefully return the hot skillet to a burner set to medium heat. Add the corn starch mixture to the hot pan, and bring to a boil, stirring constantly with a whisk, scraping the goodness from the bottom of the pan. Cook for one minute, or until the sauce is slightly thickened and shiny. Spoon the sauce over the chicken, and serve with fresh lemon wedges. This was perfect with a side of simple steamed asparagus, or add a pile of angel hair pasta if you’re looking for a carb boost.